It always surprises me around this time of year that summer hasn’t technically ended. Less so when I hear about sweltering heat in LA or abiding humidity in Florida, but at least around these parts, it feels like fall. We’re retiring our AC and pulling out sweaters. The air has a crisp snap to it in the mornings; the leaves are edging golden. The subway fills up more on my way to work, and I’m back to coming home from work in the cool gloss of darkness. At the same time, there are still fleeting hints of summer around, even if it doesn’t feel like it outside. The afternoons are sunny, and the local markets are still overflowing with summer produce. This past weekend, I came home with a bounty of white nectarines that were sweeter than candy. And this week, I’m still eating ice cream. This (dairy-free!) Thai peanut version, to be specific. Truth be told, I’m kind of overdue for a homemade dairy-free ice cream. Eating a lot of lactose almost always makes me uncomfortable, but because I’m bad, I do it anyways — clearly. And clearly again. (I’m single-handedly setting back the cause of people with mild food intolerances.) But after a few too many internal struggles, and after coming across an abundance of gorgeous dairy-free ice creams this summer (just look here and here! ), I thought it was time to own up, because frankly, the dairy-free versions are just as good — if not better! This is a riff on a Jeni’s flavor I’ve been meaning to try for a long time. Her Bangkok Peanut ice cream has fascinated me ever since a friend came back from a Jeni’s in Nashville raving about it, and I thought it’d be the perfect place to start with dairy-free ice cream, given that it already contains coconut milk, and all her ice creams are egg-free to begin with. In addition to the cornstarch and corn syrup combination Jeni already uses to fortify her ice cream, I added a tablespoon of bourbon to keep the ice away, as per Ashley’s tip to add alcohol, and replaced the cream cheese in her formula with a little extra peanut butter. I was completely in love with the taste and texture that resulted. It was the fluffiest, softest ice cream I’ve ever made, with a thick and creamy texture that’s reminiscent of gelato. 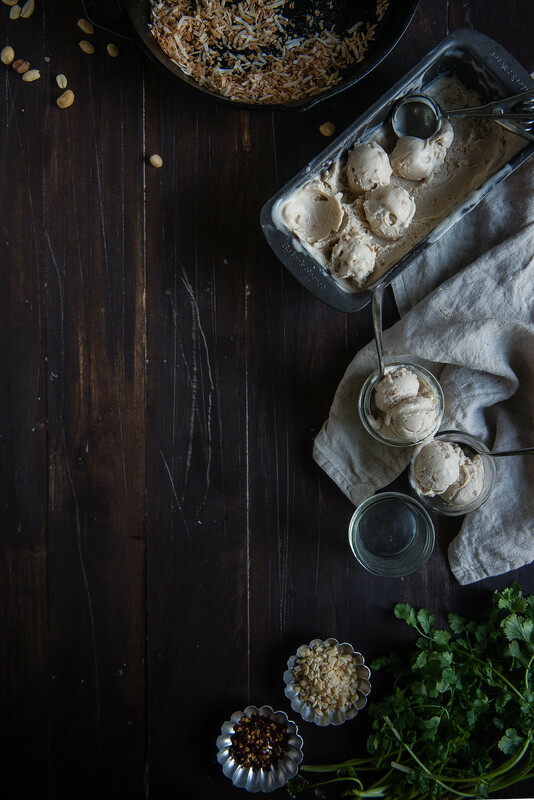 And just like Jeni says, the taste is like pad Thai in ice cream, in the best, least-weird way possible — it has a subtle coconut flavor, the smoothest, richest peanut butter taste, and a punchy edge from the cilantro and red pepper I ended up topping it with. To me, it’s an ideal bridge between late summer and early fall. Cool and refreshing, but creamy and decadent enough to be comforting, especially with the touch of heat from the cayenne. I hope you’re all having a great last Wednesday of summer! Edit: The first version of this post listed this ice cream as vegan, which I’ve now realized was totally incorrect. It contains honey, so it is only dairy-free. You can replace the honey with agave nectar, maple syrup, or more corn syrup to keep the recipe vegan. Thank you so much to the commenter who asked! A vegan version of Bangkok Peanut, by Jeni's Splendid Ice Creams. I topped it with fresh cilantro when serving, which adds a considerable bite -- if you hate cilantro, or if you find it flavorful enough on its own, of course feel free to omit it. In a small bowl, whisk together 1/4 cup of the coconut liquid with the cornstarch. Set aside. In a cast-iron pan, toast the coconut shreds over medium-low heat for several minutes or until shreds begin to turn light brown, taking care not to burn. Remove from pan and set aside. Combine the rest of the coconut milk, salt, sugar, corn syrup, and honey in a saucepan over medium high heat and bring to a rolling boil. Cook, stirring continuously, for about 4 minutes. Remove from the heat and add the cornstarch mixture. Return to medium high heat and continue to simmer for about one minute, until slightly thickened. Remove from heat. Place the peanut butter in a small bowl and slowly whisk a small portion of the hot milk mixture into the peanut butter, until smooth. Add the peanut butter mixture back into the rest of the hot milk mixture, whisking continuously, until incorporated. Finally, add the cayenne pepper and toasted shredded coconut. Pour the ice cream mixture into a gallon Ziploc or a large jar. Add the vodka (or whatever alcohol you’re using, if using) then stir, seal and place into ice bath until chilled. Alternatively, skip the ice bath and chill the mixture for several hours or overnight. When ready, churn according to your ice cream maker’s instructions. Pack the ice cream into a freezer safe tin, then store in freezer until firm, at least three hours. Serve! I topped it with extra toasted coconut, peanuts, fresh cilantro, and extra red pepper. Oooh, I love the sound of that! I haven’t explored any of her non-ice cream creations yet, but I just bet they’re every bit as delicious. Thanks so much, Ileana! Oh girl, please hold on to it extra for me! I’m not ready to let it go yet. Speaking of summer, I meant to tell you way back — your hummingbird cake story KILLED ME. Was it Mama Dip’s cake or your other grandma?! That is too, too hilarious, though probably not at the time.. I hope yall still got to enjoy it!!! I just bet it was so beautiful and delicious still! I am fan of any peanut butter mixture in ice cream but with vodka and chilli? HEAVEN! I love putting sweet chilli sauce into my caramel topping for ice cream because I am so addicted to chilli. Whoa!! This is so cool and I am totally curious to see how it would taste. I am loving the sort of out there flavor of cilantro in ice cream! High-five for cilantro love!! I know, it definitely adds an intense kick … so not for everybody! But a smidge was fun, I thought 🙂 Thanks so much, Tieghan! 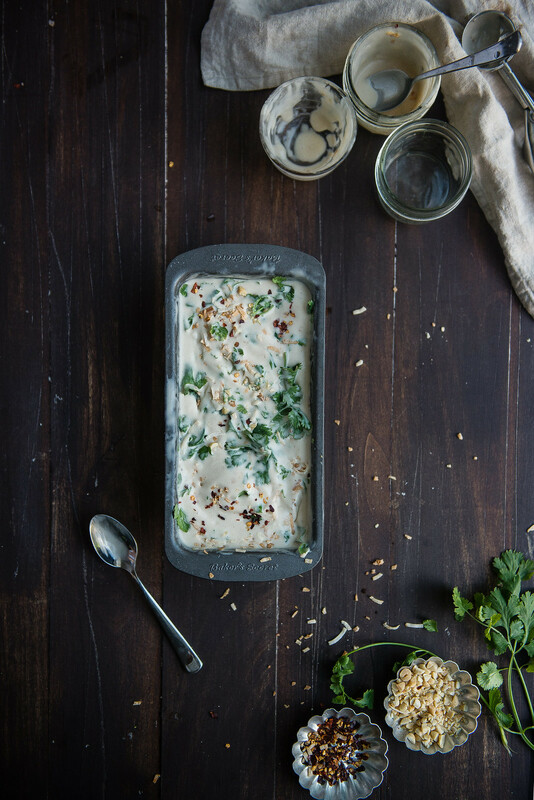 Amazing – who would have thought chili and coriander on ice cream would be so tempting? I had to look up what cilantro was (it’s coriander) and found a ‘I Hate Cilantro’ society as one of the first hits. Gobsmacking. oh my goodness this looks amazing. i am down for ice cream any time of year! Right?! Cheers to us sharing an ice cream in January ;);) Thank you so much, Jane!!! Hugs and kisses to you and Piri as always! This is such a creative flavour!! LOVE! this looks phenomenal! i also hail from the sometimes-sort-of-lactose-intolerant camp and still eat dairy anyway…this makes the whole dairy free idea sound much more appealing! Baha I’m so glad I’m not alone! But it’s true, there’s really no reason to subject ourselves to tummy troubles when there’s such a wealth of dairy-free goodness out there.. I’m super excited to keep exploring it. Thank you so much, Mel! Love, love, love everything about this! Jeni’s is one of my favorite ice cream cookbooks, her flavor combinations are absolutely fascinating. Right?! There are so many more I want to try! She’s pretty much a genius. As a good Brazilian, I love anything coconut – this ice cream looks delish! I’m all about the coconut, too. 🙂 Thank you so much, Patricia! Omgomgomg THIS. The natural foods market I frequent carries about a half dozen Jeni’s flavors, but they’re all on the tamer side. (I think the “craziest” one might have been sweet potato + torched marshmallow.) I’ve definitely never seen Bangkok Peanut there, because I would have bought it immediately and eaten all of it shortly thereafter. Pad thai in ice cream form is pretty much a dream I didn’t even know I had until 10 minutes ago. Coconut, peanuts, heat, CILANTRO. Ahhh!!! I still do not get the combination of sweet and savoury …but with pea nuts I should give it a try))! Oh this reminds me of taiwan’s crepe wrapped ice cream with shaved peanut brittle and cilantro! Sounds so weird but taste so goooood. 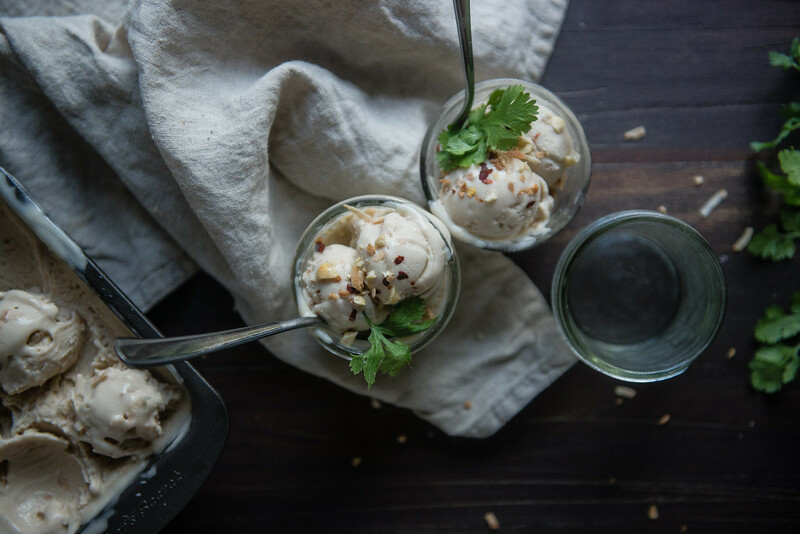 Cilantro + ice cream…you blow my mind Cynthia. Holy awesomeness!! This vegan ice cream sounds just perfect and totally unique. I didn’t try Jeni’s Bangkok peanut ice cream when we were in Nashville, but now I’m regretting my flavor choices! i am totally living vicariously through your beautiful new-york-in-the-early-fall words… this might be my favorite time in new york. *sigh* THANK YOU for saying that vegan ice cream is just as good if not better. have you ever had raw ice cream company ice cream??? they only sell it in new york (i think) at whole foods and it costs an arm and a leg, but it is raw and vegan and one of the best ice creams i’ve ever had. AND THIS PEANUT ICE CREAM THOUGH. cilantro??!?!?!! you’re a badass. you are so totally right about this weird, in between seasonal thang going on! i’ve still got squash, tomatoes, and peaches, but also apples, winter squash, tons of kale and pears! and ice cream is so necessary right now (but really, when is it not?)! 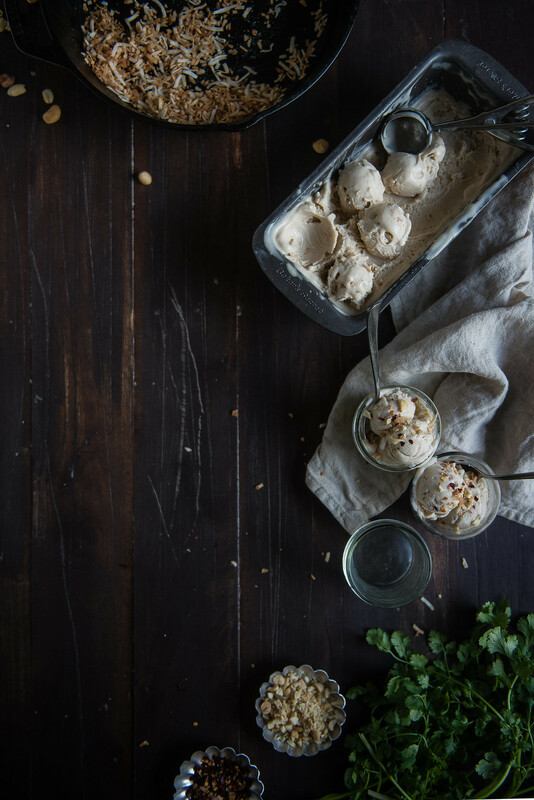 i am so digging the mix of cilantro and peanuts in a sweet ice creamy form, cynthia! and yay for vegan ice cream!!!! <3 <3 <3s to you! I can’t say anything other than amazing! Beautiful photos! And what and interesting flavor. Can’t wait to try it! As for fall, I don’t know what you’re talking about. San Francisco’s summer is just beginning (July and August are typically foggy, “summer” is September/October). What a fantastic ice cream, love that it is made out of coconut milk. Perfect for any time of the year. MAN OH MAN. I want this in my life, like, yesterday. I love non-dairy ice creams! I can handle dairy fine, but there’s just something about a coconut based frozen treat that I love! Ooh, lady. 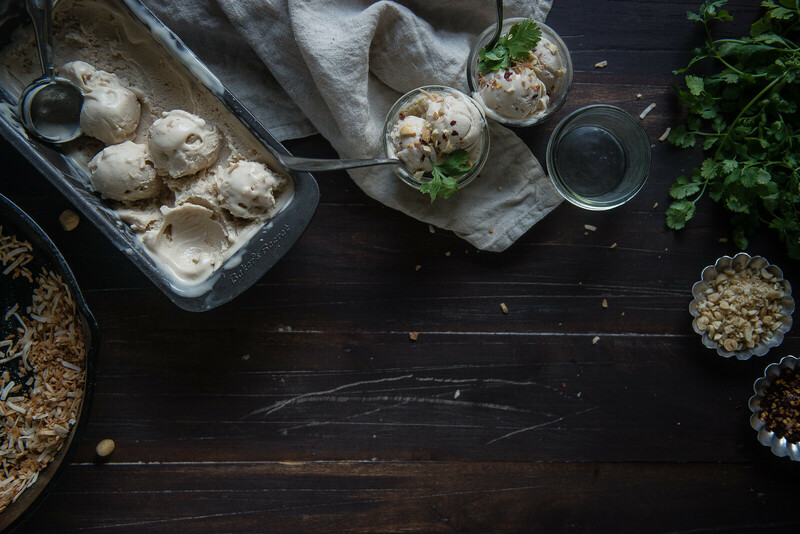 I just love the complex flavors of this ice cream – AND THAT IT’S VEGAN! It was 90˚F in Denver today and won’t be cooling down until the end of the week, so I think I’m going to need to give this a whirl before summer officially ends. So even though it IS still hot as volcanic monkeys over here, it’s officially summer somewhere in the other hemisphere–and let’s face it, since when did we need an excuse to ice cream (yes I just turned that into a verb)? 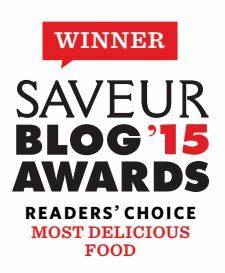 I’m also overdue for a vegan ice cream–and as I gushed elsewhere, peanut ice cream is my FAV. Had my first and loveliest taste of it in Taipei 101. 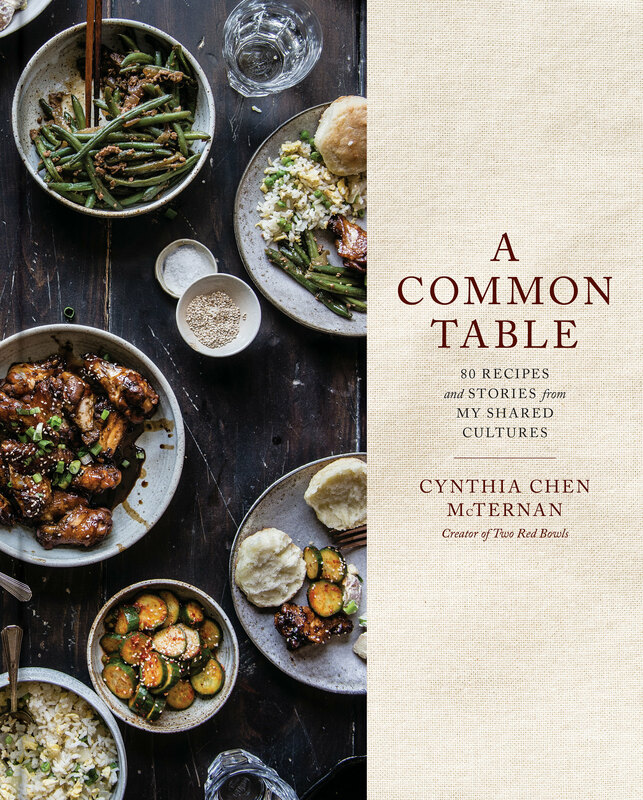 I will be trying this and sharing it evurywhareee, Cynthia! I love absolutely everything about this ice cream; the final touch with the cilantro is just pure genius. Gorgeous! There have indeed been some pretty awesome looking vegan ice cream recipes popping up on the Internet lately and I’ve been intrigued to try one of them. Thanks to you, now more than ever! I love it how you come up with the most -to me- unthinkable sounding new recipes. This looks amazing and the ‘fluffiest, softest ice cream’ sounds heavenly! Pad Thai in ice cream form? I’m intrigued! I definitely know what you mean about fall – it was freezing on my walk to work this morning but then I see it’s going to hit the 80s this weekend so I’m hoping I can squeeze in a little more ice cream before it gets too cold. I’ve never seen something this out-of-the-box with ice cream, lady! And we have Salt and Straw here! You’re putting them to shame. Man I bet they wish they thought of cilantro in peanut ice cream! FOR VEGANS. I would love to try this crazy concoction! I am so in love with Jeni’s method because I can hardly be bothered with custards….. hashtag lazy hashtag humanely-raised eggs cost soooo much. This was a great read, thank you! this recipe speaks to my SE asian heart!! i love the cilantro and peanut toppings….and coconut milk too?! mmm. i want to make this. Hi I totally buy it and love this salt-chili-sugar twist to ice cream. I was browsing your blog for the mooncake recipe (finally received the molds from China this week !) and now feel frantic because i want to do the mooncake AND the ice cream.. While my work presentation still needs to be done 🙂 Thanks for the inspiration, love it! Enjoy your week end! You are serious flavour genius! I would never gone to cilantro + ice cream land. Thanks for the trip. I am so glad you asked this — no, it’s not vegan at all! D’oh. What a huge oversight by me. I’ve corrected the recipe to dairy-free. Thank you so much for the great question!